View of Shalfleet Lake on the Isle of Wight. Shalfleet is situated in the north east of the island, on the Caul Bourne River at the southern end of the Newtown Estuary also known as Shalfleet Lake. 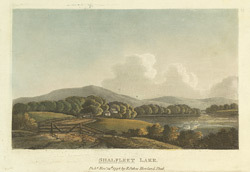 The name Shalfleet is though to be of Saxon origin, from ‘Sceol’ meaning shallow and ‘fleot’ meaning creek. The village is recorded in the Domesday book as Seldeflat and has since been known as Schaldfleet and Chaldyflete.